But also for your “we’d like to be in VR now that it’s hip (again)” moments. Photo by TORLEY on Flickr. 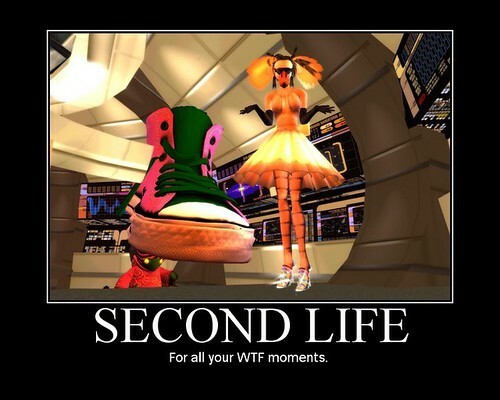 although you probably haven’t heard much about it lately, Second Life hasn’t gone anywhere. With 900,000 active users a month, who get payouts of $60m in real-world money every year, and a virtual economy that has more than $500m in GDP every year, Second Life is still a world of opportunity. Today, the rising tide of virtual reality — with companies like Facebook, HTC, and Sony betting big on immersive 3D technology — means that Second Life’s time may have come around. “Now the world is waking up again,” Ebbe Altberg, CEO of Second Life developer Linden Lab, which now has over 200 employees, told Business Insider. Linden Lab is marshalling its expertise and experience in building immersive, functional virtual worlds to make a proper successor to the Second Life platform and take advantage of the bold new world of immersive VR. Specifically, Linden sees a huge opportunity in making it easier for people to build and share cool virtual reality experiences. I loved – still love – my Blackberry Bold. It is the best email sender/receiver ever invented. Its physical qwerty keyboard is still better than the puny iPhone 6 touchscreen. Its battery lasts for days too. But, it can’t really do anything else. And that last sentence is the key thing, isn’t it? For instance, an app that controls the [self-driving Mercedes] F 015 can also turn the cameras it uses to see the road as remote prying eyes. Through the app, you can connect to the car’s cameras to spy on the car’s surroundings through your phone. It effectively turns your car into a lurking Dropcam that can be used to watch unknowing passersby, anywhere, anytime. Or as another journalist on the junket put it, it turns every single vehicle into a Google Street View car. The privacy implications will be huge. But it doesn’t stop there. Just like your iPhone or Android device, your car will communicate with other internet-connected devices in your life. It’ll learn your habits and adapt to your needs. For instance, say your car “realizes” you’re on your way home at dinner time. It “knows” your smart fridge is stocked with nothing but booze, so it prompts you to go to the grocery store or local eatery to pick up some grub. It’ll pull up the number of your favorite restaurant or suggest a new one based on your preferences. While you call, your robo-butler adjusts its course to take you where you need to go. By the time you arrive for curbside pickup, your credit card will already have been charged. We come back then to the question we have to decide. Against the background we have described, and in the absence of any sound reasons of policy or principle to suggest otherwise, we have concluded in agreement with the judge that misuse of private information should now be recognised as a tort for the purposes of service out the jurisdiction. This does not create a new cause of action. In our view, it simply gives the correct legal label to one that already exists. We are conscious of the fact that there may be broader implications from our conclusions, for example as to remedies, limitation and vicarious liability, but these were not the subject of submissions, and such points will need to be considered as and when they arise. (A “tort” is a legal wrong.) Google has fought this case all the way – particularly because the original judge, Tugendhat, decided that hacking someone’s device to follow them to collect data about what they look at online is a tort. Google will probably appeal this to the UK supreme court. The full decision is twisty, so don’t rush it. A few hours ago District Court Judge Liam O’Grady ordered a default judgment in favour of the US Government. This means that the contested assets, which are worth an estimated $67m, now belong to the United States. “It all belongs to the US government now. No trial. No due process,” Dotcom informs TF. More than a dozen Hong Kong and New Zealand bank accounts have now been forfeited (pdf) including some of the property purchased through them. The accounts all processed money that was obtained through Megaupload’s alleged illegal activities. The list of forfeited assets further includes several luxury cars, such as a silver Mercedes-Benz CLK DTM and a 1959 pink Cadillac, two 108″ Sharp LCD TVs and four jet skis. At first glance, the new S6 and S6 Edge appear to be less cluttered, but you’ll actually find some 56 applications pre-installed. That’s 6 more than the 50 you’ll find on the Galaxy Note 4! Between the Google Apps you’ll find on every phone (Play Newstand? Come on), Samsung’s apps like S Voice and S Health, the new Microsoft apps like OneDrive (intended to soften the blow of no microSD slot), assorted social apps like Whatsapp and Instagram, and carrier apps (6 on T-Mobile), there’s a ton of cruft. A Moto G I have hanging around — which runs near stock Android — starts with just 33. And despite statements from Samsung that “Samsung has allowed users to remove the pre-installed applications on Galaxy S6 and S6 Edge,” the most severe action you can take is “disabling” them. This removes them from the app drawer and the homescreen, but not from the phone entirely. You’re basically opting instead to put them in a sort of stasis, out of sight but not out of storage. They don’t take much storage – Limer suggests about 100MB – but it’s the principle, really. Will the reviewers find the S6 “stripped back” even so? For a tech company that places so much emphasis on design, we can’t help but think something’s up when one of the key designers leaves. Today, we bring you the sad news that HTC’s VP of Industrial Design, Jonah Becker, has announced his departure on Twitter. To our surprise, that’s less than a year after he picked up from where his predecessor Scott Croyle left off. we have learned from our sources that there is an ever increasing power struggle between the design team and sales team these days. Another source told us the switch from the M8’s UltraPixel main camera to the M9’s 20-megapixel counterpart is an example of such. HTC is in so much flux, yet clings on doughtily to existence. As investors and analysts panic about how Google’s search advertising revenue growth is slowing because it can’t charge as much for mobile ad clicks as desktop ad clicks, this move gives Google another huge avenue for mobile monetization. sponsored links in the search engine results page,” analysts from Credit Suisse wrote in a note Friday morning. Credit Suisse included two charts in its note that perfectly underscore exactly why investors and analysts love this move and why it could have negative effects for Android developers. SSDs and other flash memory devices will soon get cheaper and larger thanks to big announcements from Toshiba and Intel. Both companies revealed new “3D NAND” memory chips that are stacked in layers to pack in more data, unlike single-plane chips currently used. Toshiba said that it’s created the world’s first 48-layer NAND, yielding a 16GB chip with boosted speeds and reliability. The Japanese company invented flash memory in the first place and has the smallest NAND cells in the world at 15nm. Toshiba is now giving manufacturers engineering samples, but products using the new chips won’t arrive for another year or so. I can wait a year, though I haven’t managed to fill the 512GB drive on my laptop in three years. This entry was posted in links and tagged dotcom, driverless, google, htc, privacy, safari, samsung, tort by charlesarthur. Bookmark the permalink.